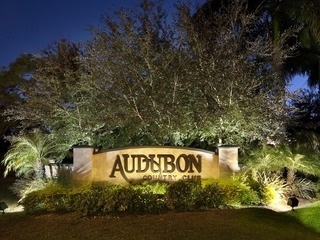 Audubon is a private, gated country club west of US41 and only minutes away from the white sand beaches of the Gulf of Mexico and four of the area's best beaches. This low-density community features only 410 residences comprised of estate homes, detached villas and 36 low-rise condo units on 755 acres of lush natural foliage. The community's fine homes, endless activities, and hundreds of acres of untouched preserve make Audubon Country Club truly a unique private club, and it is a Certified Audubon Sanctuary - one of only 800 worldwide. Members of the club enjoy the 35,000 square–foot, newly renovated clubhouse with amenities that include a championship golf course, eight Har-Tru tennis courts, two lakefront regulation croquet courts, state of the art fitness center, indoor and outdoor dining venues, and 25-meter outdoor pool.